Press conference by the President of the United Nations General Assembly, Ms. María Fernanda Espinosa. Convinced that “revitalizing the UN and advancing multilateralism go hand-in-hand”, Assembly President Maria Fernanda Espinosa Garces said that she was engaging with world leaders in New York and abroad, “to promote this objective”. She also vowed to work on revitalizing the General Assembly, as well as on reforming the UN Security Council and aligning the UN’s objectives to the 2030 Agenda for Sustainable Development. Calling the 2030 Agenda “a cornerstone of the success of multilateralism”, she stressed the importance of building greater public understanding and support for it. Her second priority was on implementing two new global accords on refugees and migrants, for which she had appointed two co-facilitators to consult with Member States on arrangements for the International Migration Review Forums – the primary intergovernmental platform for States to discuss implementing and share progress on the Global Compact. “I will also continue raising awareness about the importance of an informed debate on international migration, which is based on facts and figures, to help Member States develop their own policies and support the implementation of Global Compact for Migration” she stated. As a Gender Champion, Ms. Espinosa’s third priority focuses on gender equality and women’s empowerment. “I am committed to strive towards gender parity within the General Assembly and gender equality in its outcomes, starting with my Office where gender equality is a reality”, she emphasized, noting her newly established Group of Gender Equality Leaders. Fourth, under the priority related to the creation of decent work opportunities, she spotlighted the need to build on the momentum created around the review of Sustainable Development Goal 8 (SDG 8) in the High-Level Political Forum on Sustainable Development (HLPF) under the auspices of the UN Economic and Social Council (ECOSOC) in July as well as the commemoration of the 100th anniversary of the International Labour Organization (ILO). Protecting the environment is Ms. Espinosa’s fifth priority. “We need to see climate change response as an opportunity to set a course for a better future for human beings and towards a greener, cleaner and more sustainable world”, she maintained, particularly as it “is accelerating faster than our efforts to address it”. On plastic pollution, she asked for partners in “walking the talk” by reducing single use plastics within missions and at UN facilities. Under the rights of persons with disabilities, her sixth priority, she said that a Steering Committee on Accessibility at the UN had been launched in December on the eve of the International Day for Persons with Disabilities. Moreover, she plans to launch the campaign for the Universal Ratification of the Convention on the Rights of Persons with Disabilities this month and host a High-Level Event on Persons with Disabilities in June. 29 January: In collaboration with the UN Foundation, the first meeting of the Group of Gender Equality Leaders will be kicked off to accelerate women’s empowerment. 31 January: Along with the President of the Economic and Social Council (ECOSOC), will brief Member States on aligning both body’s work with the 2030 Agenda for Sustainable Development. 4 February: Meeting with former General Assembly presidents on the theme: “Revitalization of the United Nations in favor of a strengthened multilateral rules-based system” to craft recommendations for a UN that delivers effectively and efficiently for the people. 14 February: Convene a joint briefing with the Special Envoy for the Climate Summit to outline the roadmap for preparations towards the Climate Summit in September. 19 February: Meeting with mayors and others under the theme: “From Global Issues to Local Priorities: The role of Cities in the Global Agenda, including Cities for Sustainable Development, Food Security, Nutrition and Climate Change” to share experiences of effective local practices and strategies to address global challenges, such as climate change, food security and malnutrition. 21-22 February: Will organize with the Inter-Parliamentary Union (IPU) the 2019 Parliamentary Hearing at the UN, on the theme: “Emerging challenges to multilateralism: a parliamentary response”. 27 February: Will organize a High-Level Debate on International Migration and Development. 12 March: Convene a High-Level Event on Women in Power, dedicated to promoting women’s leadership by bringing together senior leaders to share experiences and young women leaders to foster the environment of dialogue. 28 March: Host a High-Level meeting on the Protection of the Global Climate for Present and Future Generations of Humankind to pave the way for the Climate Summit. 10 April: In close collaboration with the International Labour Organization (ILO) and ECOSOC, convene a High-Level Event on “The Future of Work for Decent Work”. 24 April: Host a High-Level Event on the International Day on Multilateralism to exchange views on its role with diplomacy in advancing of the UN’s three pillars of sustainable development, peace and security and human rights. 27 April: Organize with Norway and Antigua and Barbuda during its annual ‘Sailing Week’, a festival to raise awareness, celebrate successes, and push forward progress to address plastic pollution. 13 September: Organize, a High-Level Event on Culture of Peace to shine a light on the observance of the 20th anniversary of the adoption of the Declaration and Programme of Action on a Culture of Peace. September: High-Level Political Forum on Sustainable Development (HLPF) will be convened for the first time under the auspices of the General Assembly (HLPF Summit). Ms. Espinosa outlined the work the Assembly had already achieved since she took office in September, beginning with the “unprecedented” number of world leaders at the 2018 general debate, which sent “a strong message” in support of multilateralism and the Organization. 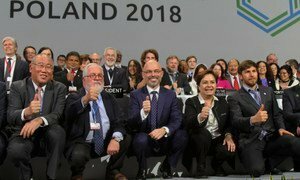 She noted that in Marrakech, “we adopted the Global Compact for Safe, Orderly and Regular Migration”, and also the “so-called rulebook” for the Paris Agreement at the Climate Conference in Poland. Among others, she: conducted a one-day High-Level Meeting on Middle-Income Countries that yielded concrete recommendations to address gaps in implementing the 2030 Agenda; launched a series of Morning Dialogues with Ambassadors on thematic issues challenging the Organization; and appointed 28 co-facilitators and co-chairs, almost 60 per cent of whom are women.